Artful Affirmations: Tea Cup Tuesday-Little Accidents! and now I am typing this slowly with one hand! Do some of you remember this cup??? Why the postwoman left it leaning against the garage door i will never know! And maybe you can guess what happened??? Yep, my husband backed out of the garage in our van and over the box! to use in my jar of Epsom Salts! These salts are good for sore muscles and sprains. A cup in your hot water creates a healing and relaxing bath. Here in America, we can buy these salts in the grocery store in a large box. behind the Pharmacy counter, and I could only get a tiny container! Curious...still don't know why they think it is dangerous? Thank you for stopping by and reading my recycled post! If you would like to join in, just add your url to your tea cup post below. Lovely tea cup and I liked your first photo a lot! What a pity the broken plates. Don't matter. Here it's fashionable to mismatch sets, you can try. Besos from Argentina and thanks for hosting! Oh so sad, but still lovely! Very pretty still without the plate Terri, in fact, gorgeous! But what happened to your hand? I hope you are okay.....and I know it will be just a minor setback, your creativity never stops! Hugs! But your cup is so pretty it looks great in its new function. And the broken saucer also made a very good photograph! Funny, I just took an epsom salt bath a little while ago, I do often. But not TOO often b/c it sure dries out one's skin! I am glad you found a way to use your pretty teacup, though- sure is a happy and beautiful one! What a lovely tea cup and saucer. What a shame that it has smashed ! It looks very Marie Antoinette. I am visiting for the first time and your blog is lovely ! what a pitty, the saucer cracked. This set is so nice. I don't know why you can't buy Epsom salt in UK in larger quantities. Here we use it mostly for plants in the garden. 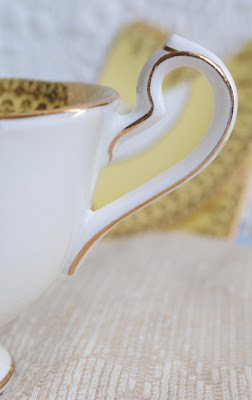 Thank you for sharing this wonderful tea cup and for hosting this nice event. I think the only reason why the Epsom salt is sold in small quantities, here in Europe, and especially in pharmacy, is to increase its prestige and its price! What a beautiful epsom salt scoop! So sorry so see that your beautiful saucer is broken. 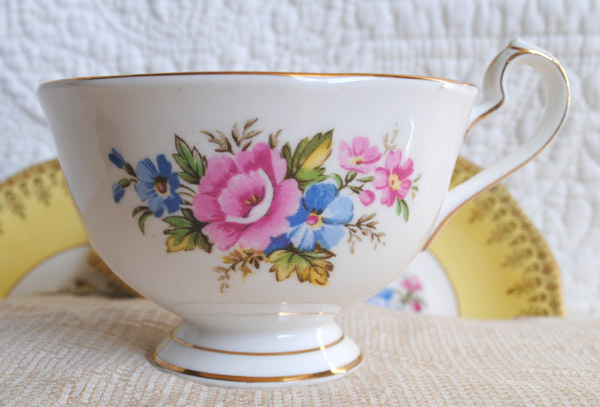 I am so sorry to hear about your pretty teacup and I hope you can find a replacement. Glad you found a use for it though. Ah, what a shame! Such a pretty set. I use an old-fashioned tin cup for my epson salts. A friend gave me the cup so it is very sentimental. Have a lovely day, Terri. Oh, Terri, I am sorry that you now have to do everything with one hand. I do hope you heal soon. The pattern of your tea cup is very beautiful and am glad that you can still put her to good use. I think I would have to talk to the mail lady about where she should leave packages in the future. Too bad about this lovely set. As for Epsom Salts being sold over the counter; it is considered as a drug. You can use it in your bath and it's loaded with magnesium, and very relaxing, but they must have had too many cases of mis-use in some way to be put behind the counter. Epsom Salts is good to relax blood vessels and can lower blood pressure. It's good for someone with high blood pressure or hypertension, but lowering the blood pressure too much can lead to hypotension and cause medical complications like dizziness and shock. Or if someone is using it as a laxative can cause gastrointestinal problems like vomiting and severe diarrhea which these can cause sever dehydration. Some have had allergic reactions and some have really actually OVERDOSED to where it can be so severe that an individual becomes comatose. Although it can be used for a relaxing bath, still be careful in it's use. It's great for exfoliating and should be good on that injured arm. Hi Terri.....I'm not a stranger to loosing a tea cup or two that way...accidental breaks are no fun....but at least you made the best of it. I love your repurposed use. It's such a cheery cup. I only hear that Epsom salts are good for you.....that is curious. Either they don't know that yet, or they know something we don't know....makes you wonder. Terri, I guess it's good you wanted a salt scooper! So elegant. I love the yellow. Happy Tea Day and thanks for hosting! hope you're healed quickly-no fun using only one hand :(. 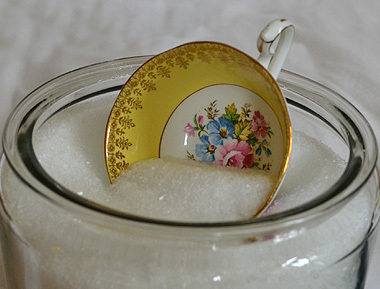 What a shame about your beautiful tea cup saucer but you have found such a lovely way to display and use your cup. Thank you also for your sweet comments on my blog-much appreciated! I found the Epson salt in a Danish welness web shop, where I can buy one and a half kg. in a container- for 17 dollars-- I don`t know about this salt ,just wanted to check, when you wrote that about England! Is that also a small portion compared with what you can buy ? Love your yellow cup, even without saucer...sorry it broke for you! So sorry to learn of your accident. I hope you will heal quickly and be back to your old self in no time. 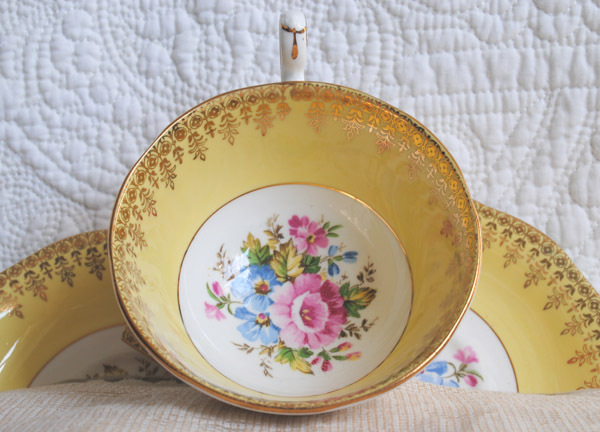 That broken saucer would look lovely sticking out of the dirt in your flower garden, or in a potted plant as a backdrop. And there's always mosaics to make. Or perhaps it will find a home in a piece of altered art. 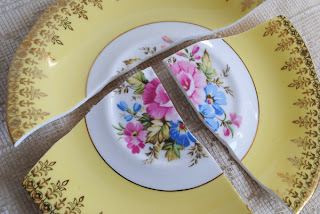 Oh, the possibilities for broken bits of crockery are endless! How fun that you have repurposed it so you can still enjoy it's beauty. It is a gorgeous piece! So very beautiful..even broken..silly postman!Gorgeous yellow..so uplifting! I use epsom salts too and we can buy them here in Canada in large amounts or in big milk cartons. Interesting story! !Yes perfect for your cup!! Enjoy my friend! That's so funny you should post that. Just yesterday we saw the postman throw a little package at my neighbors house like it was a bowling ball. We were stunned! The cup is such a happy color. Maybe you can use the plate as a mosaic project. You're so clever. I'm sure you already figured something out.